Garlic is normally planted in the fall. Planting at that time of the year allows the garlic bulb to be exposed to several weeks of cold temperatures which stimulates bulb production. Missing the fall date can be disappointing, it means waiting an entire year before planting a crop. If you are the type of person who doesn’t mind experimenting a bit, spring planting may be a option. Bulbs grown from spring planted garlic are significantly smaller which is why it is not recommended. Farmers would never be able to make a profit with an undersized crop, but in a garden it is worth having some fun with. The other thing with spring planted garlic is finding bulbs to plant since most seed companies ship their garlic in the fall. One solution is to plant garlic from the supermarket produce department. You’ll never know what variety you’ll be getting but look at it this way, someone had a good enough crop with them to grow enough to sell. Even though spring planted bulbs will be smaller, that doesn’t mean they will not be usable. You’ve probably eaten green onions before, you can eat green garlic too. If you’ve never tried fresh green garlic right from the garden, you’re in for a treat. The garlic taste is quite unexpected when your taste buds are expecting an onion flavor. Don’t let them get too mature though. Green onions or scallions that swell up at the root end as they get older are still quite usable. Green garlic at that stage will start to develop the separations that eventually become cloves. When that happens tough membranes form that eventually become the papery wrappings over each clove that you see in full sized garlic. Those membranes make the young garlic too chewy to enjoy eating. At that point you just let them grow. This is about the smallest size clove I would plant in the spring. Since your spring planted garlic is late, you’ll have to give it every advantage to make growth. The first important thing to remember is garlic hates to be planted on it’s side. 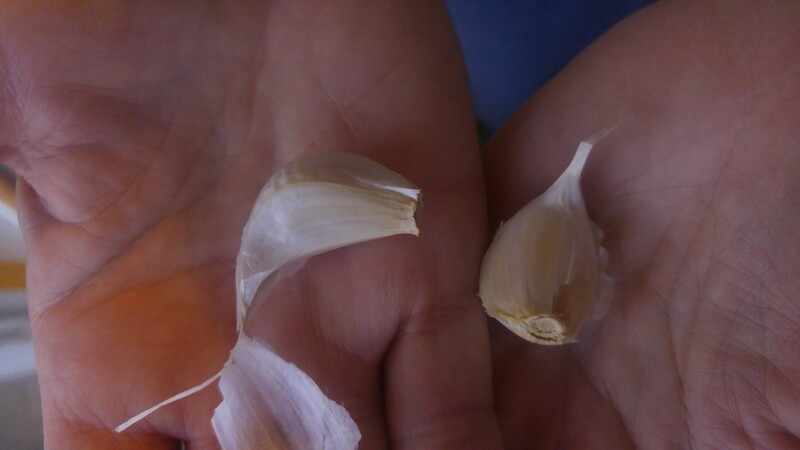 It’s critical that you plant the garlic clove with the bottom pointing down, don’t just toss it into a hole otherwise you’ll reduce the size of the mature bulb even more. In your richest area of your garden, dig your planting hole so that top of the clove is covered by about two inches of soil. Plant the cloves between 3 and six inches apart; the closer spacing for green garlic, the more distant for garlic bulbs. Early and season long weed control is essential, garlic just doesn’t compete well with weeds. Kill those weeds while they’re still little and keep it up all through the season. Make sure the soil is kept evenly moist but not soaking wet. The object is to try to encourage the garlic to grow as much as it can early in the season so that it will have plenty of green leaf area for photosynthesis. If you’re going to do this thing, do it now — don’t wait until May. Garlic needs as much cool soil as you can provide during the early stages of growth. With some care and persistence, you’ll end up with a culinary conversation piece that will surprise your garlic loving friends.